Jason A. Ramos is a long time van-lifer, adventurer, and experience-chaser. From his first van in 1997 to his current Sportsmobile, he has lived off-grid for decades. His adventures fuel his passion to find the best gear that will get you through any and every situation. This passion grew into a successful business called Product Research Gear where Jason and his team take outdoor gear into the harshest conditions and test it, in search of the very best gear. Jason’s journey into solar began with a single 45-watt panel and has grown into his perfect combination of large roof mount panels for his vehicle and small portable panels for his phone and computer. Jason has used a few of our panels over the years. His greatest solar achievement was the time he got stranded hours from his home in the North Cascades with a dead car battery. Being smart, inventive, and willing to try the unthinkable, Jason strapped a 120-watt Zamp Solar panel to the hood of his van, hooked up the batteries, and made it home safely on pure solar power. 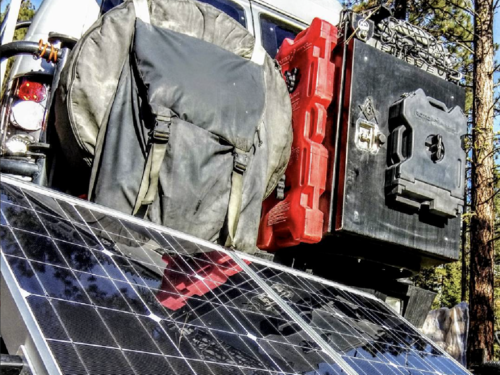 He is currently utilizing a Zamp Solar 160-Watt portable to power his adventures.